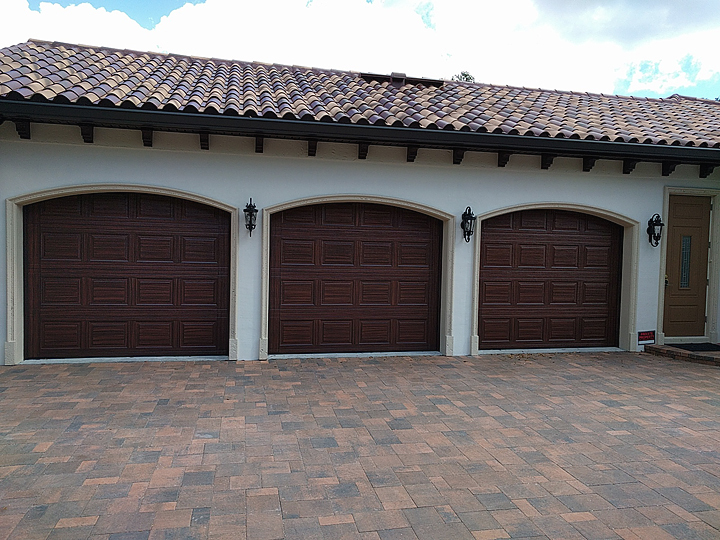 Last week I finished up painting two entry doors to match the three garage doors (of my previous post) I had painted to look like wood. This door is right next to the three garage doors so it made sense to have it look the same. The other door is around the side. 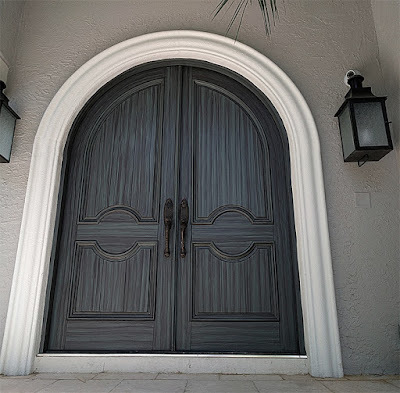 The biggest challenge with these entry doors was they are oversized. About 96 inches high instead of your standard 81, which means I had to use a ladder to reach the top. 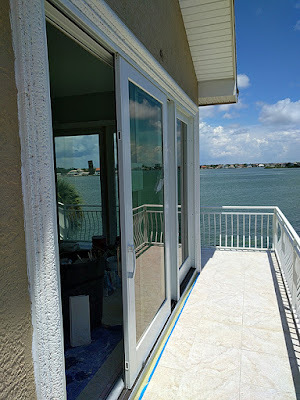 The is door is a fiberglass door and started out all white. You can see where I was testing out the primer to see how well it would adhere. I use grey 'gripper' primer from Glidden and after it dried you couldn't scrap it off at all, worked fantastic. 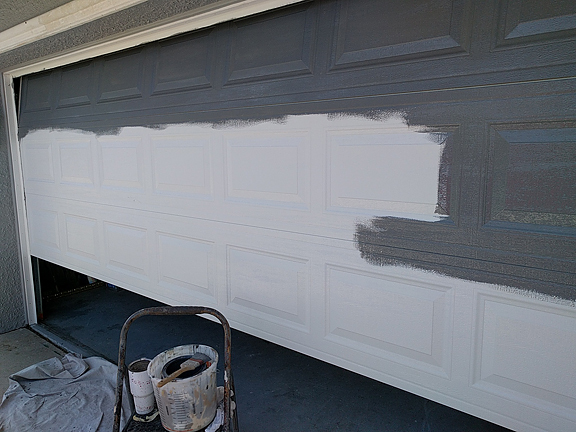 So after the primer dried I applied the base coat of paint, SW Toasty the same as the base for the garage doors. 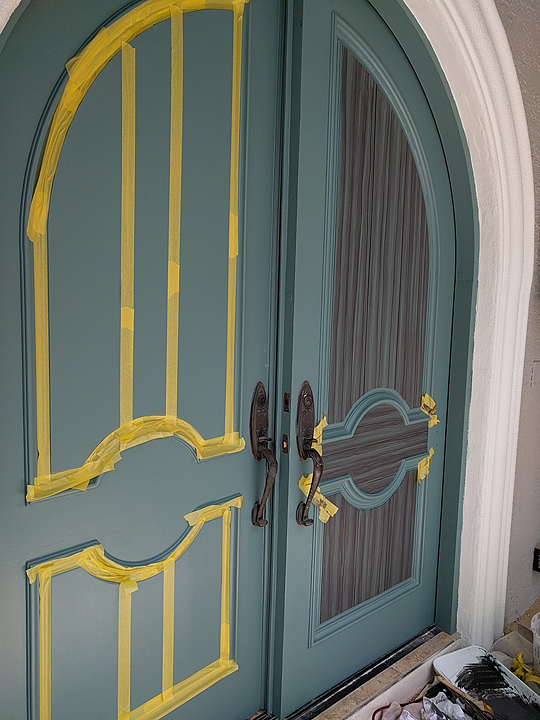 I start by taping off where the horizontal wood grain will be painted in. Then once taped off I use SW Fiery Brown for the first coat of wood grain color. 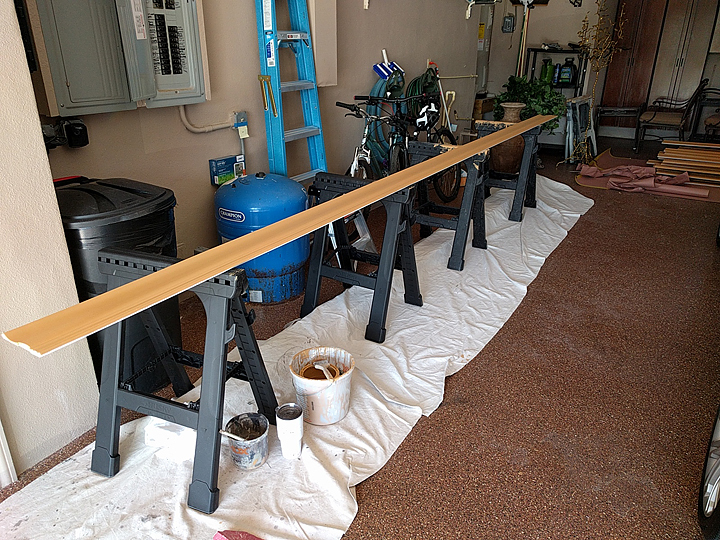 Then I use SW Black Bean for the second and darker coat of wood grain color. 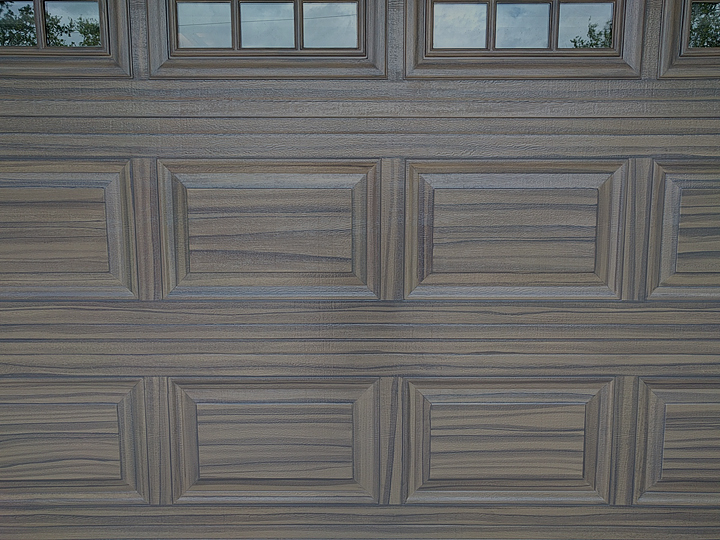 This next photo is a great view of the wood grain I painted on. 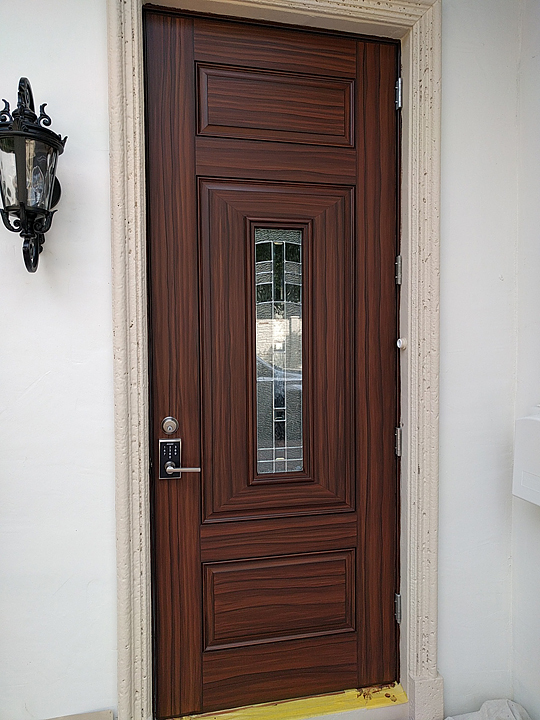 This door came out great. 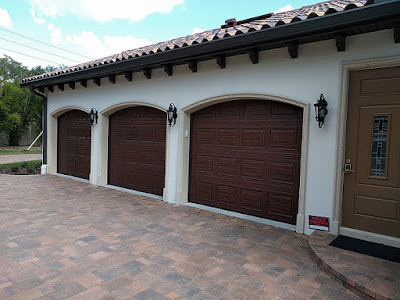 The doors came out looking beautiful and the homeowners love them but it's a real struggle to get that top row painted with a wood grain pattern. 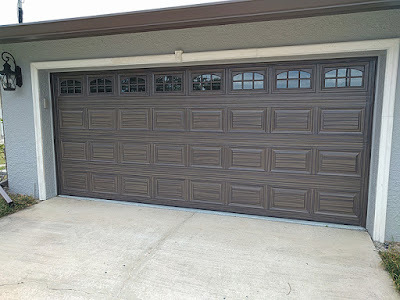 First off because the garage door opening is curved at the top these doors are about a foot higher than your typical garage door. 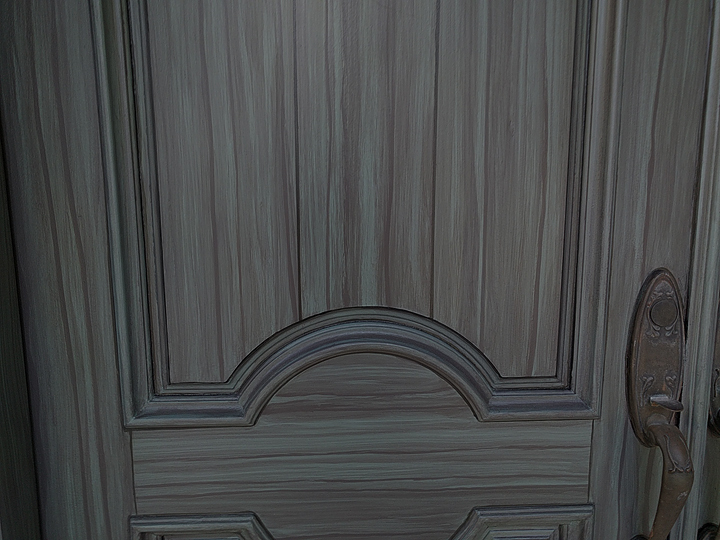 I can not create the wood grain look on the top row without having the door open up all the way and then standing on a ladder. 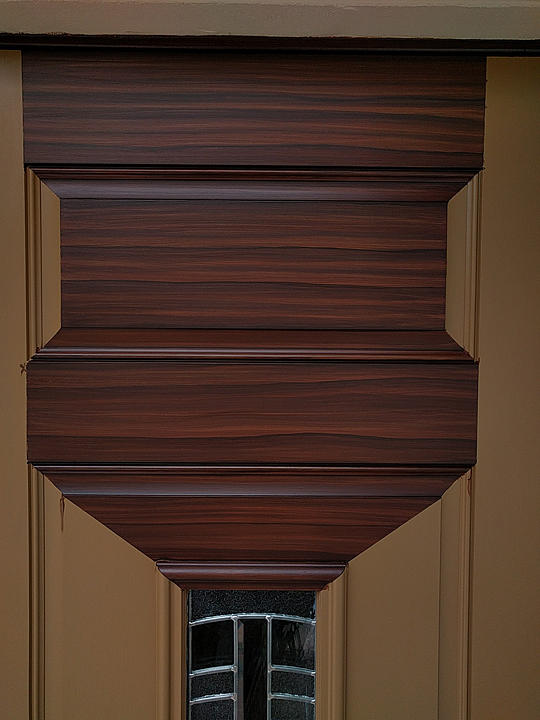 In this first pic you can see the slight gap between the door and the curved top of the opening. I am also applying the primer here. 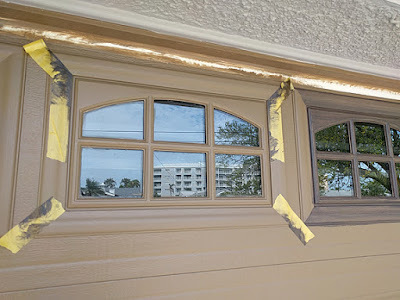 This next photo shows the gap better and also shows that I have put on the base coat paint here which is a Sherwin Williams color, SW Toasty. 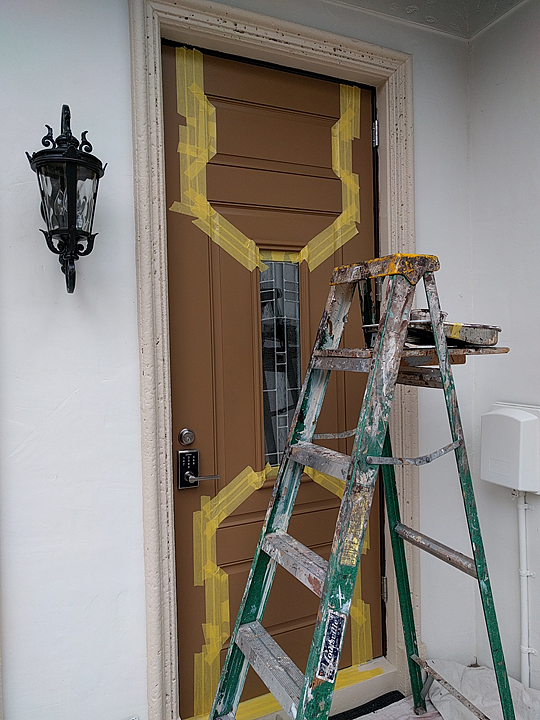 I only use exterior acrylic paint. The next photo shows the situation of working with the door open. In this photo I have primed and base coated. 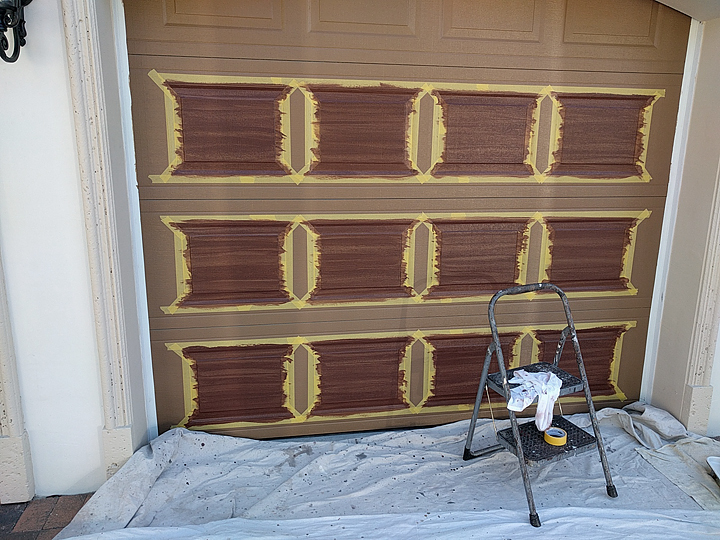 I had primed the top row of panels with the door up so that is done. 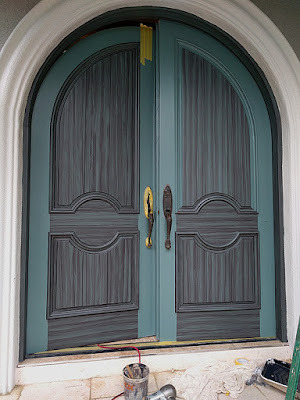 But you can see the base coat of paint and the curved line it creates when I painted it on with the door closed. 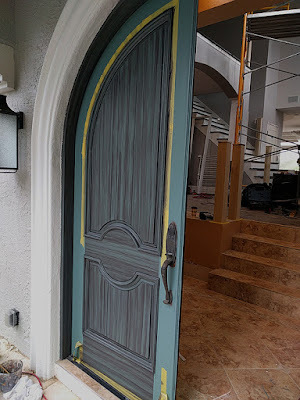 Now I have to paint on the base coat where I could not get to with the door down. Complicating the deal is the bar that the opener uses to open and close the door. 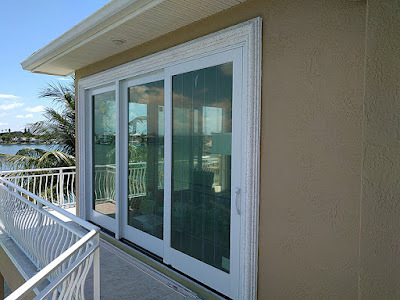 It runs right in the middle of the door and has about a 2.5 to 3 inch clearance from the door. The space between the panels which I use to create a vertical wood grain is sitting right below this bar. 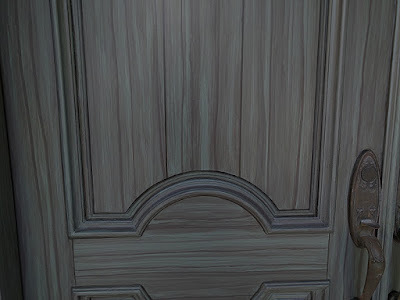 A really big challenge to paint in a wood grain with that bar there. Here is another photo of working on the top row with the door up. The thing is I have to paint in the top row of panels with the door up because I want the wood grain to run from side to side on the panels and I can not do that with the door down because the curved top blocks me from getting the whole panel. So I tape off what I can get to with the door down then put the door up and tape off the rest that way. 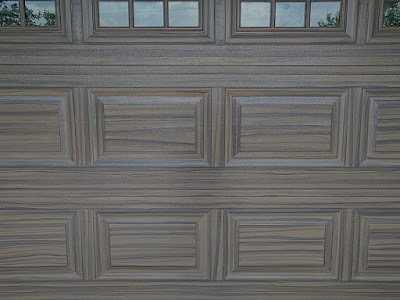 Then with the door up I paint in the wood grain. 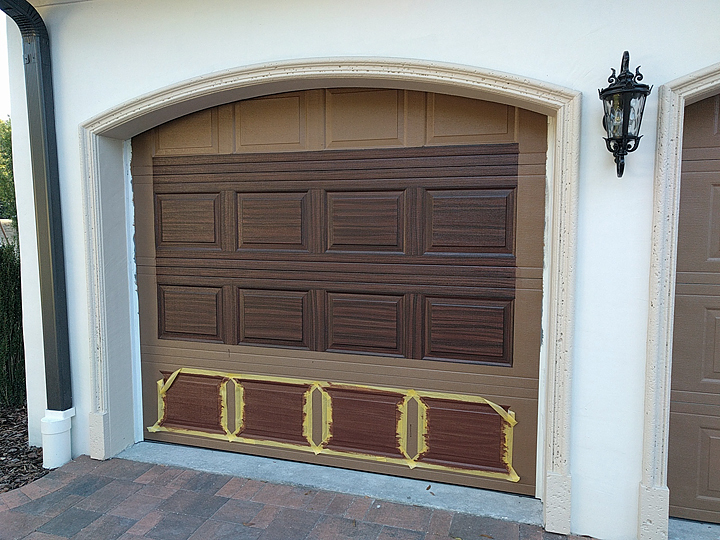 Another big challenge doing the painting like this is to be able to get the top panels to match the rest in tone. By that I mean getting them the same degree of darkness or lightness as the rest. It is way harder to do that with the door open than it is when the door is closed. 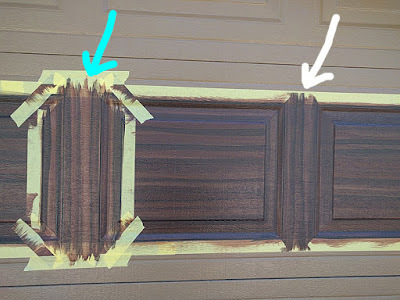 I would estimate that it takes about 3.5 to 4 times the amount of time to paint in the top row with the door open compared to when the door is closed and it's much harder to get it to look right too. 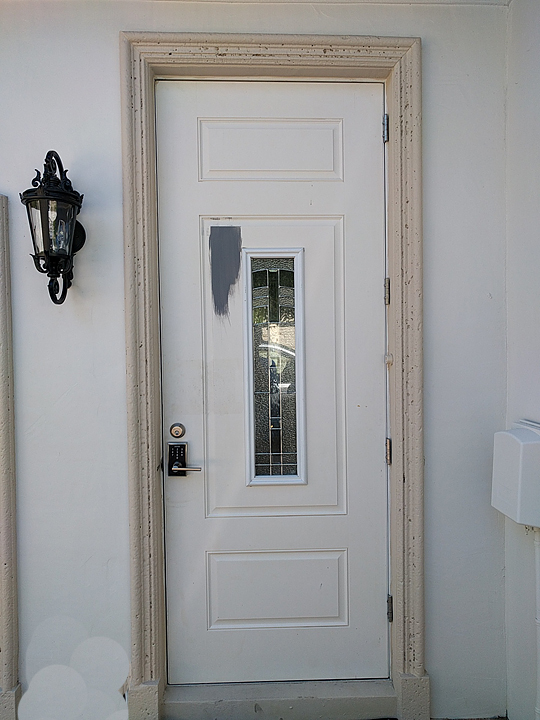 Why even bother to paint in those areas you can't see with the door down? Well first off I do a good job and that's part of doing a good job. Second when the door opens the track makes all doors bend back and when that happens you can glimpse the top of the panels. 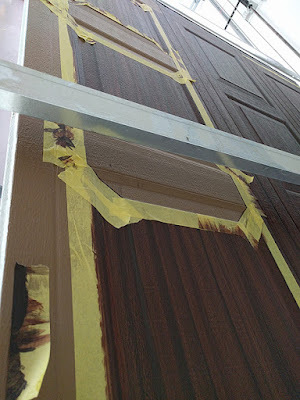 Very unprofessional to leave the top of the panels unpainted even if you can't see them when the door is closed. 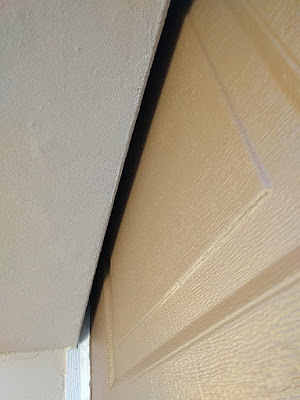 Ditto with part of the garage door that is covered up by the weather strip on the sides. 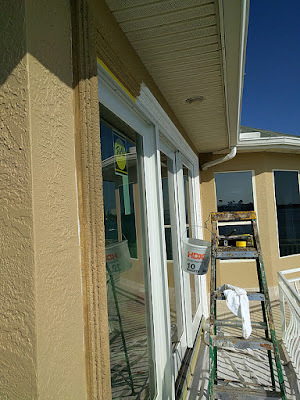 I always paint that in too because if you do not you will see a white strip there when the door opens. I go over all this in great detail in my Garage Door Tutorial. Enough with the complaining... here are some in progress photos. 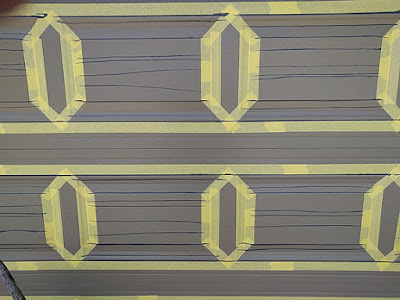 The first one shows how after I have painted in the center of the panels with a horizontal wood grain I then tape off and paint in the area between the panels with a vertical wood grain. The white arrow shows one vertical grain area complete and the green arrow shows one in progress. The colors I use on these doors is SW Toasty for the base coat, then the first coat of brown wood grain is SW Fiery Brown, the second and darker coat of wood grain is SW Black Bean. 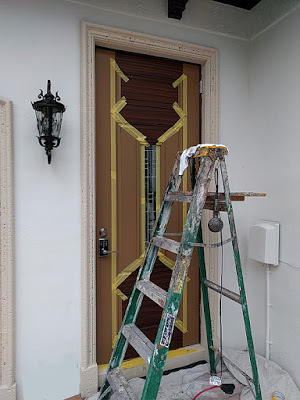 The next photo shows how I have started on the door and got two rows done and the space between them also. I started on the bottom row and have the Fiery Brown painted on those. By the way I raise the door up when working on the lower rows, that way I can paint standing up. The next photo shows how I am working on three rows at a time. I have the first wood grain color on. In this photo you can how I have started and painted in as much as I can on the top row. I could actually get most of the two center panels with the door down but not the two outside panels at all. A couple of shots of the finished project. 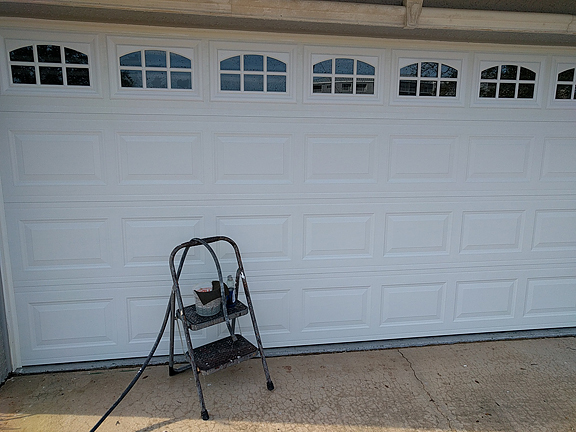 I finished up another garage door project this week. 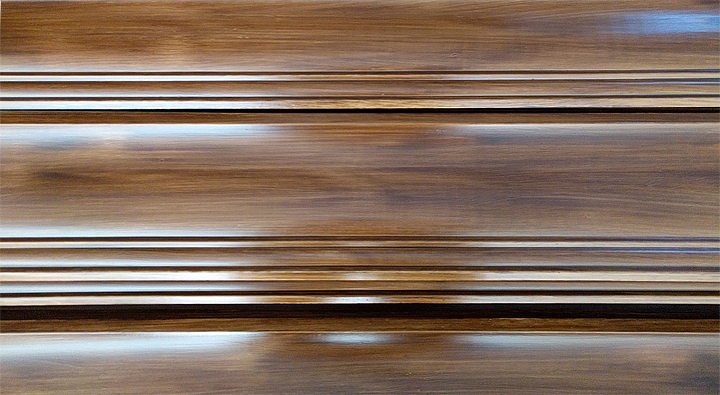 This one was created with muted wood tones. 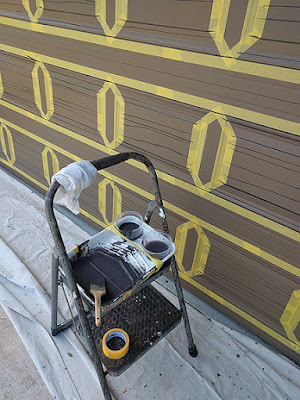 Surface prep is the most important fist step of any painting project. 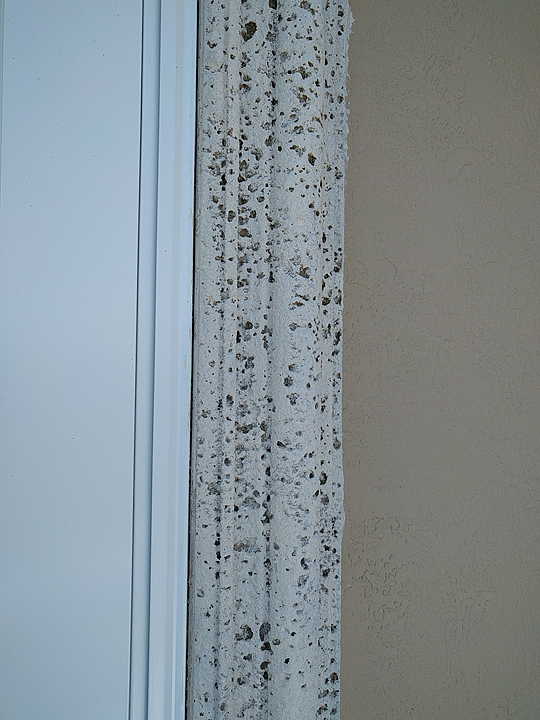 So I clean the door with soap and water and a scrub pad. My tools of the trade in the photo below. 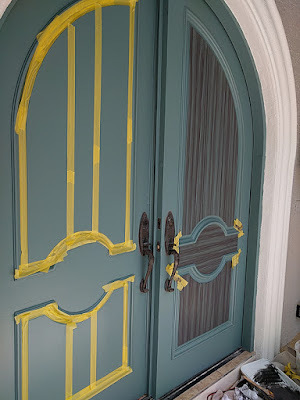 After I clean the surface of the door really well and then dry it off I apply the primer. For the primer I use a product called 'The Gripper'. I use the gray based gallon and have them add 2 onces of black tint and 2 onces of raw umber tint to it. You can add up to 7 onces of tint to the gray gripper. I do that to get a nice darker warm gray. 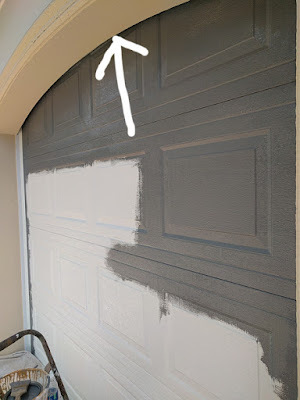 The gray it comes in stock is gray but a light gray and comes off with a blueish tone to it. That's why I add the raw umber which is a dark brown. I use that to warm it up. 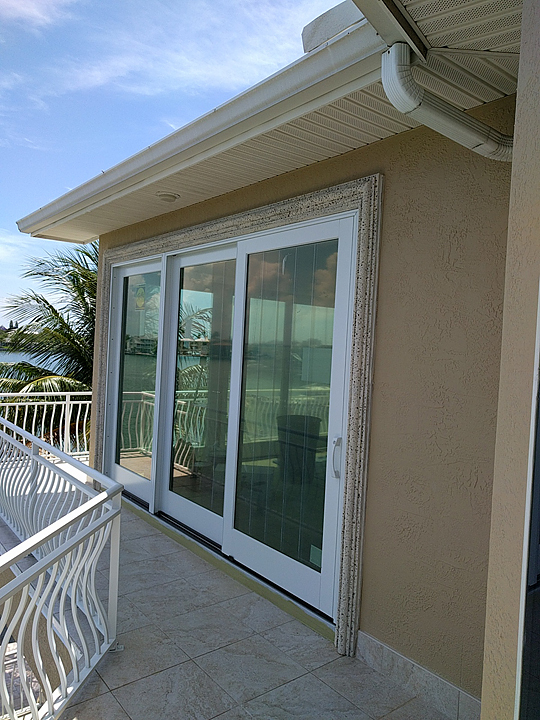 This door has the dreaded window row at the top. 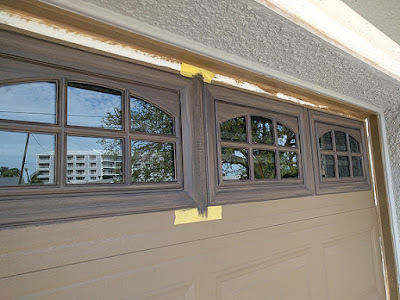 It typically adds 4-5 hours more to painting the garage door like wood to have to deal with the window frames around these 8 windows in the top row. 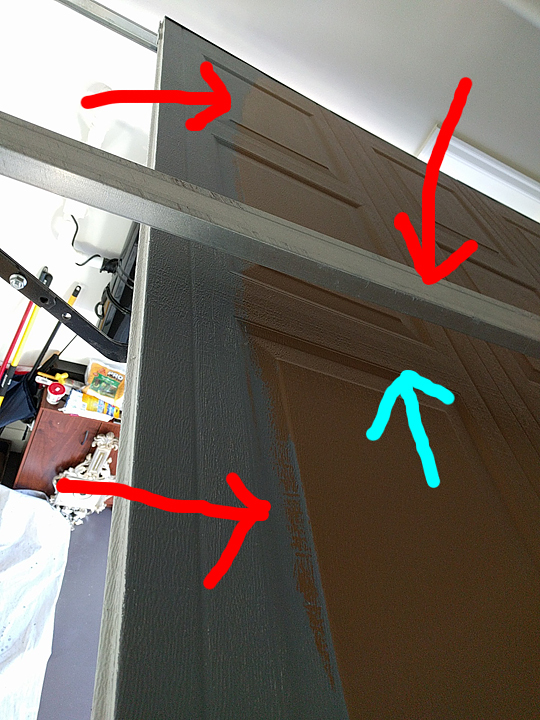 Also in this next photo you can see how I have already applied the base coat of paint on the door. The next photo is of the windows completed. They came out great but a time bandit. I really like these little stools to set the paint tray on. The next photo shows how I have my set-up when I am working on the garage doors. 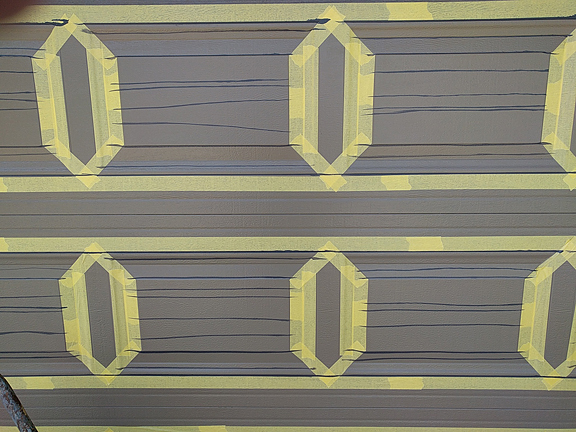 This next shot is a look at how I tape off the panels on each row. It also shows how I start to lay out the grain lines. The close-up next shows the completed project. 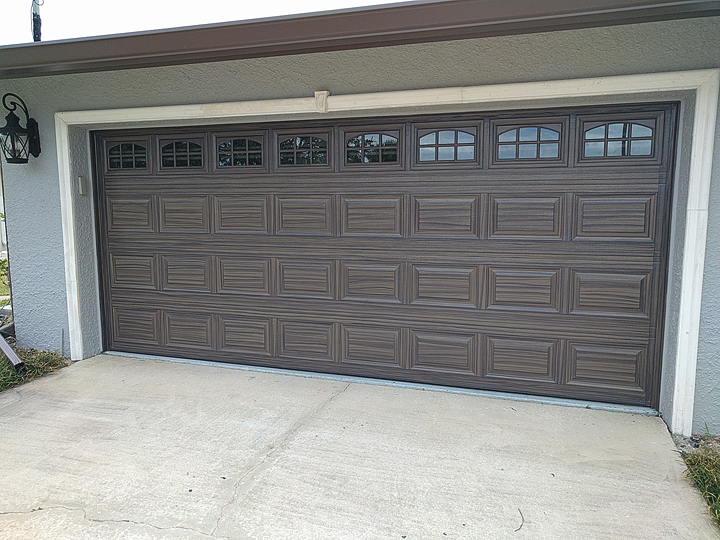 Here is the completed garage door again. 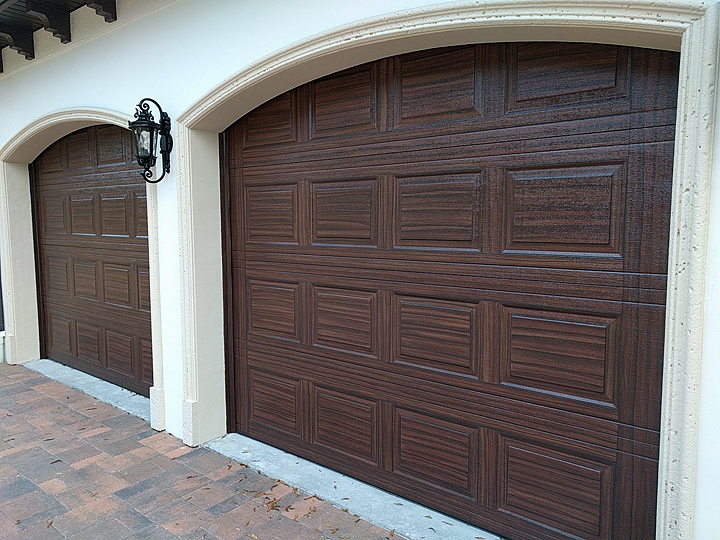 Notice how nice the wood tone matches the rain gutters over it. Coincidence? 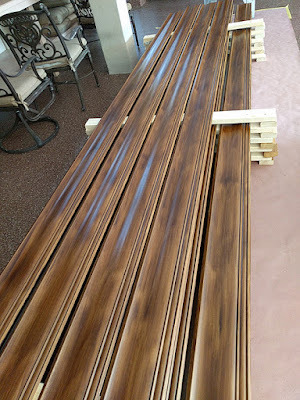 I finished up the project I have working on which was to paint crown molding to look like wood. 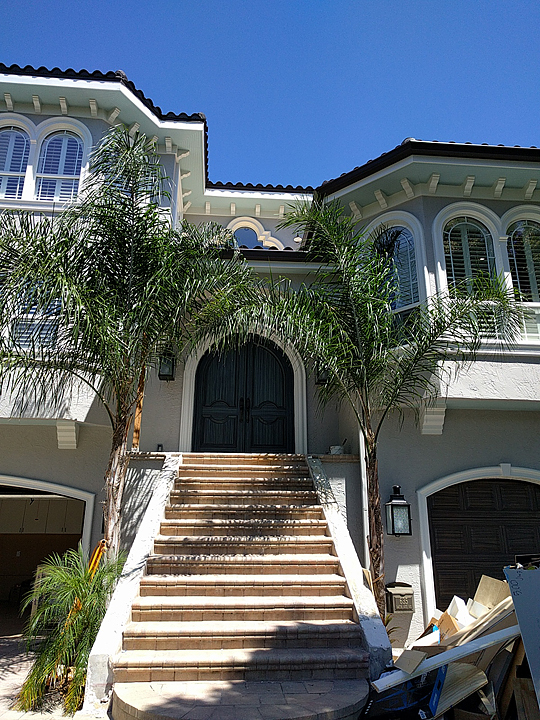 The project came out great and the homeowners really liked the crown. 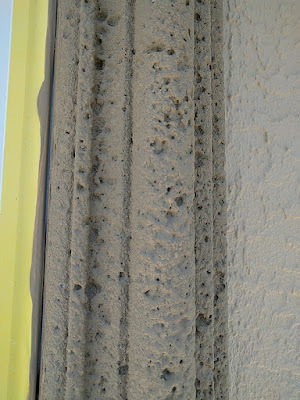 After the molding is installed I will probably have to touch up any spots but it should be minimal. I ended up painting 29, 16 foot pieces. I am working on this project where I am painting crown and base molding to look like wood. I have 22 pieces of crown and 7 pieces of base to paint. The individual pieces come in 16 foot lengths. So in order to do this job I simply can not paint each piece and lay it down on the floor and wait for it to dry. A drying rack is in order but how do you make an inexpensive drying rack for such long trim pieces. 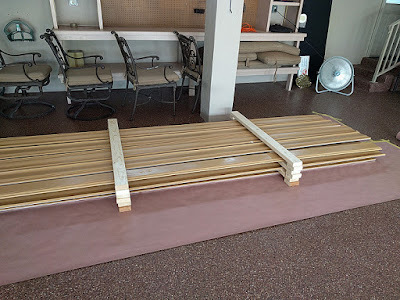 This is what I do and it is surprisingly simple, inexpensive and sturdy. The whole thing is made from regular 2 by 4's. Of course the trick is to buy straight ones or as straight as you can get. How you buy straight lumber from the store is this. We are talking 2 by's so you pick up the 2 by 4 at one end while the other end is resting on the floor. You look down the length of the piece from the end you have in you hand and you can see any warpage easily. So you go thru the stack to find the straightest ones but keep in mind they can get really straight but not perfect. After you have the 8 foot 2 by 4's you cut them in half. Then take one and cut it into 3.5 inches blocks. Take a look at the picture below. 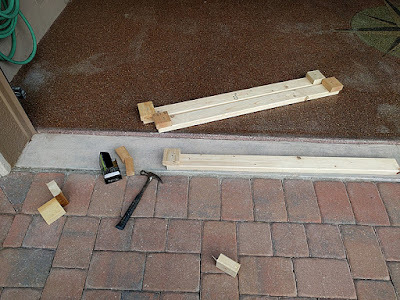 You nail the blocks into each end of the 4 foot long 2 by and you only need one 3 inch nail for each block to do this. A few of the blocks broke when I did this just to let you know. After I put some paper down I laid first row on paper then I used three of the stacking boards I made by placing one in the center and then centered the other two on either side of that. You want to place them so the block you nailed in is facing down, that way the 2 by goes over the row you are straddling. The crown I am painting is almost 8 inches wide so I can put 5 pieces per level. In the photo below you can see the stack as it grows. In the end I had 6 levels. I was a little apprehensive about how stable it would be and was totally shocked at not only the stability of it but how stable it actually was. You can't even shake it at all. I mean this system is really stable. I wouldn't hesitate to go up another 6 levels based on the stability of what I had done. The crown lays out pretty flat as you can see but if you look at the red arrow you can see a piece sagging there. That is one of the baseboards. They bend a little at the ends. If I was just doing just base I would use 4 cross members instead of the three I am using here. 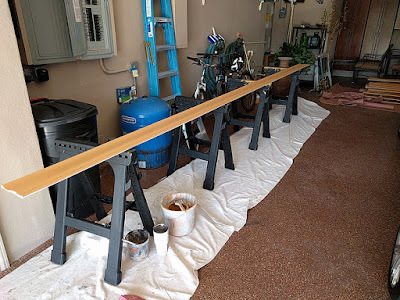 To apply the base coat of paint and also when I wood grain them I use 4 horses and lay the 16 foot long pieces across them. I needed 4 horses or the pieces wouldn't lay straight enough with the pressure of painting on them. There is one somewhat tricky aspect and that is the loading of the rack with the wet boards. So after I painted a crown piece I then lifted it up by using both hands under the center of the board as far apart as I could. Then when I took it to the drying rack because I am holding it in the center and even though my hands are about 3 feet apart it is still curved down at either end. The thing about that is you don't want to touch the other boards with the ends curved down. So the way to load the rack is to angle your hands so the board is at about 30-45 degree angle. Doing that the board does not bend very much at all. Obviously if you feel it slipping off your hands cut back on the angle. 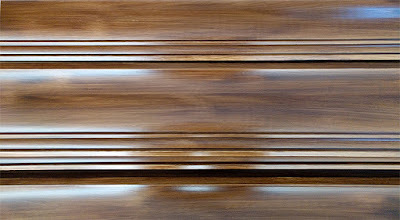 Then you rest the edge of the board on the leading ends of the two outside 2 by 4 cross pieces and relax the hold until the center rests on the center cross piece. Then I just slid the piece across the 2 bys. They slide very easily. Luckily I am working in a huge garage. 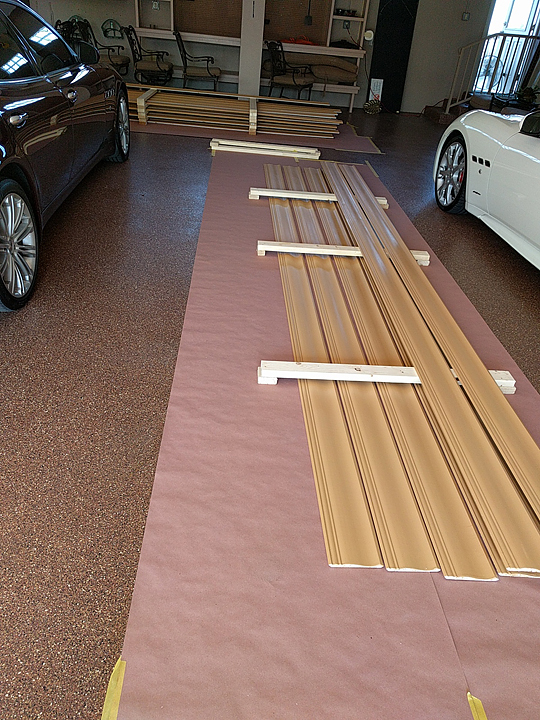 So the first stack I put at one end of the garage and then for the second coat of base coat paint I made a stack between the two cars. 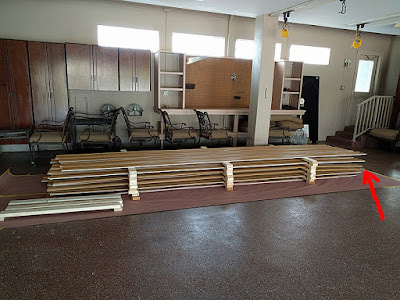 Take off the top row and paint and put that on the floor then start moving the cross pieces for the next level and so on. 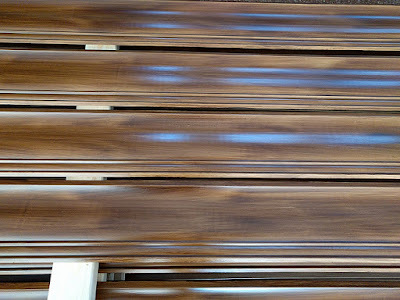 I will go back next week and start the wood grain process. 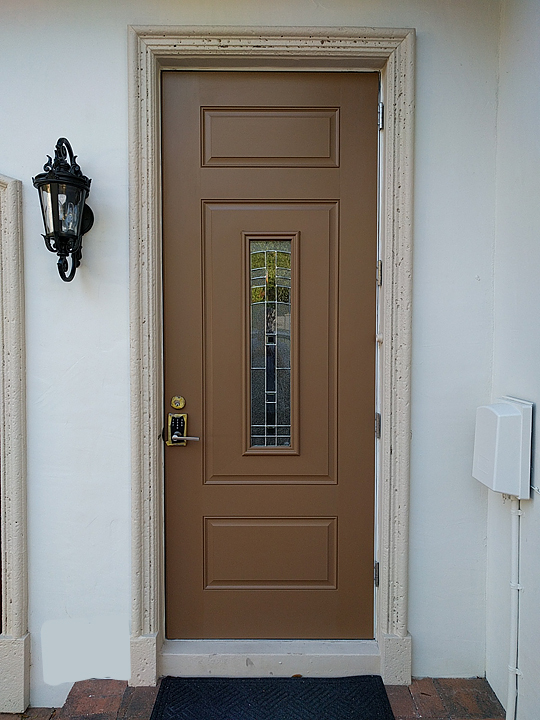 I was able to finish up a front entry door project this week. 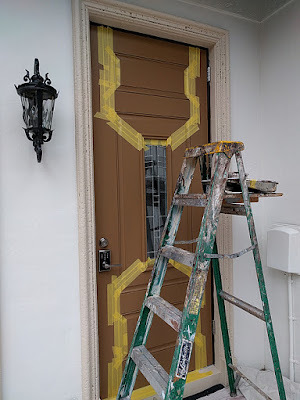 I have never painted an entry door with this color scheme and was a little leery at first but after I got finished I really liked it. The designer I work with a lot and who is in charge of this major remodel is very creative and his ideas always seem to work out great. Here is a picture of the finished doors. 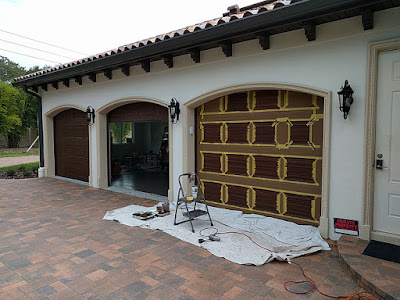 I painted both the exterior and interior of the doors to look the same. 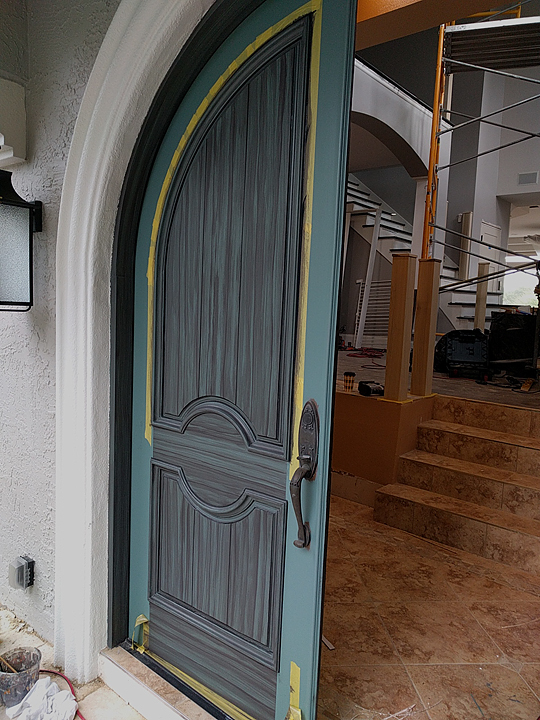 The base coat color for these doors is the surprising part. Take a look at the next photo. Believe me I was wondering how this was going to look when I started. 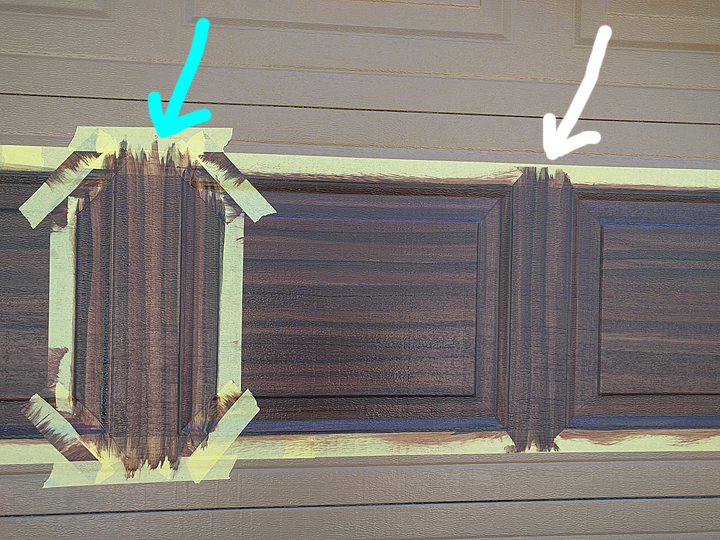 You can see that I use a lot of tape in my painting projects when I am painting doors to look like wood. This next photo gives you a peek inside. You can see the scaffolding there. The ceiling at that point is a little over 20 feet. This was a major remodel and basically the entire home got gutted and rebuilt. It is almost done however, probably another 2-3 weeks and it will be finished. 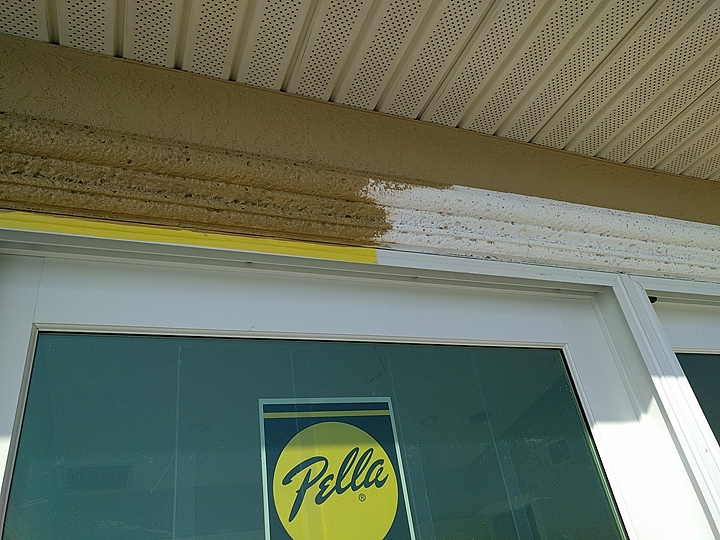 The next shot shows the contrast between the base coat and the finished look. 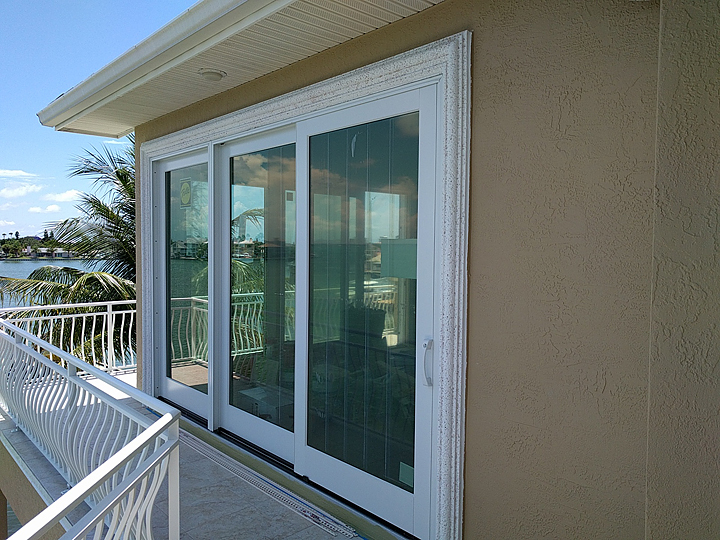 This is the approach to the front doors. The debris you see in the lower right of the photo is from the remodel. Another look at the finished doors. They came out great and everyone loves them. I finished up a project this week in which I was tasked to paint faux stone trim. 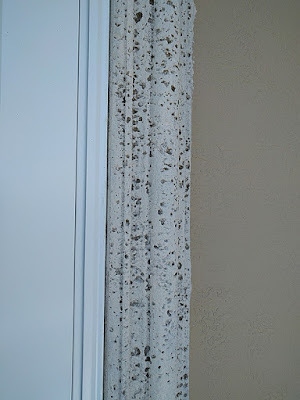 This type of stone has a lot of pock marks in it and the look is to have the pock marks a medium dark color then the surface of the stone is an off white. 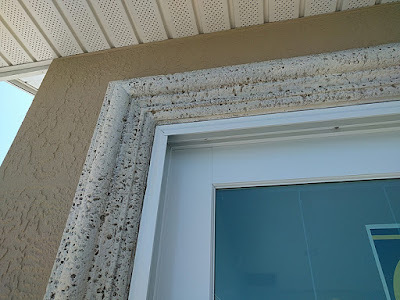 This a new construction home and apparently after the stone was applied where changes where made and more trim was added. 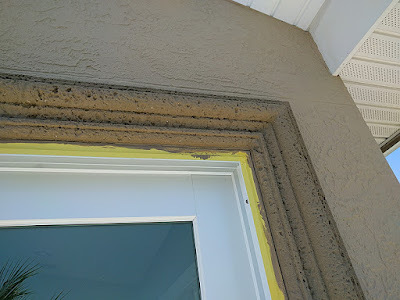 So my job was to match the new faux stone trim to the existing. When you get the new faux stone it comes white so I had to paint it to match the off white existing trim. The first two photos show a before and after. The next two photos show before. So the first thing I had to do was get the darker color into the pock marks on the foam. It was a challenge and to do that I watered down the paint quite a bit and painted it on with a very short bristled brush. That way I could 'push' the paint down into the cavities. It was a messy procedure and I had to constantly be cleaning up drips. 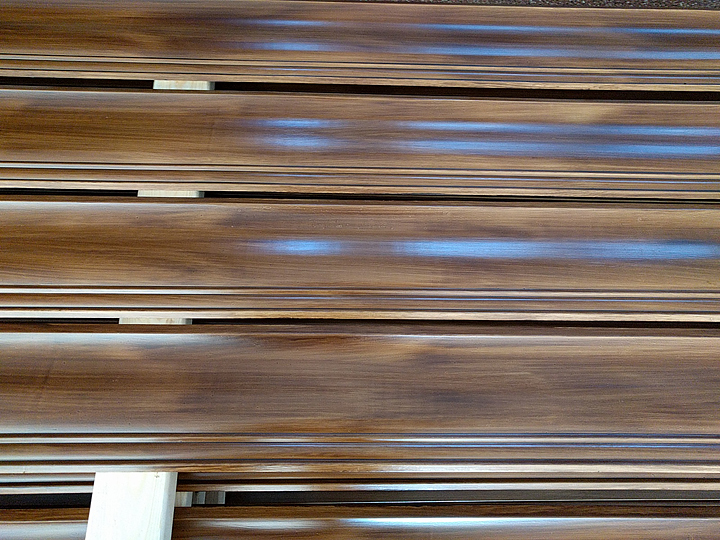 The next two photos show a stretch where I had the darker going along above one set of the sliders. Here is a close up of the deep cavities I had to first fill. 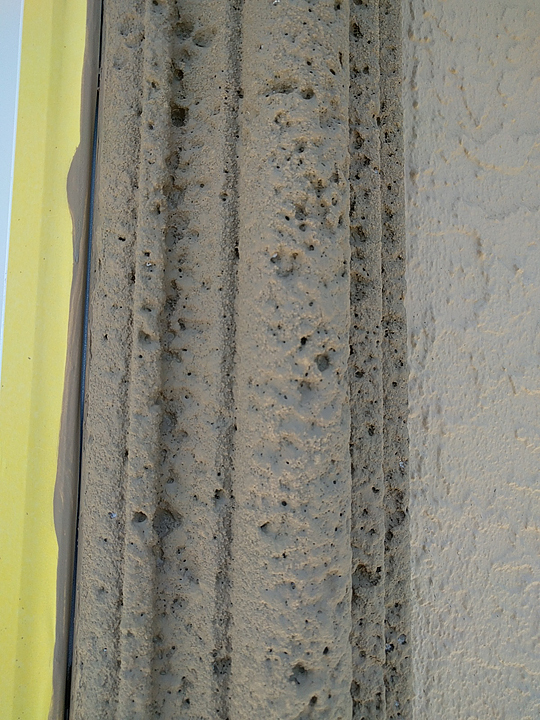 Then the same area after I 'dry brushed' the off white color on top, leaving the cavities dark. 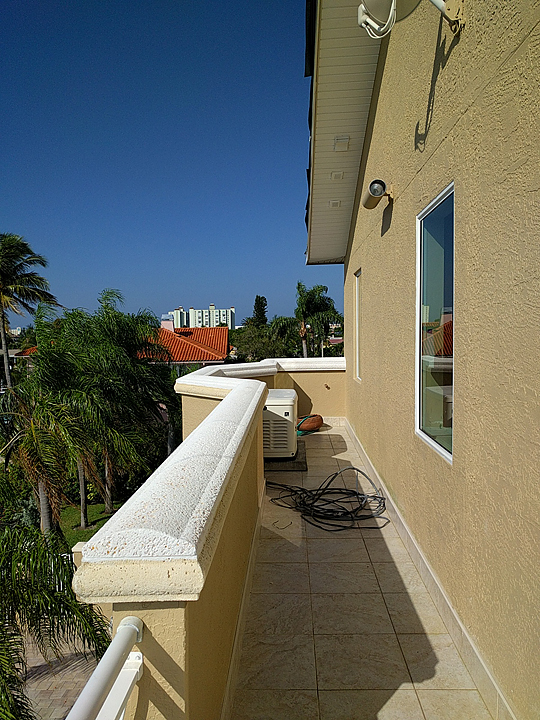 Here is a before and after of two corners. 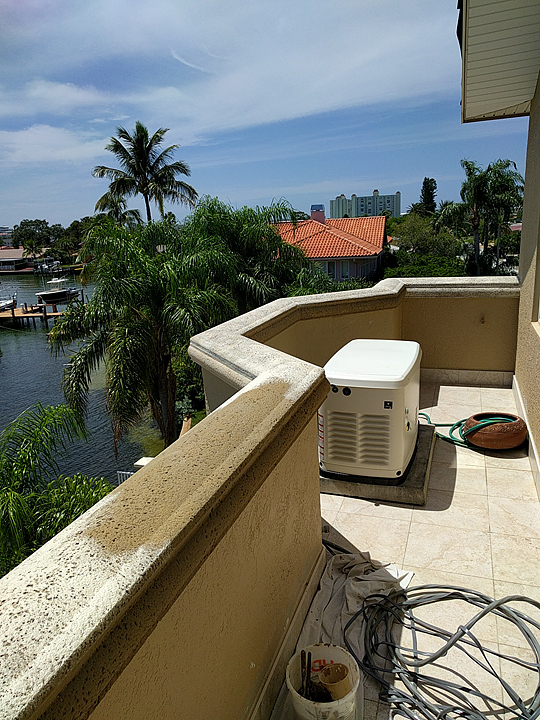 There was a little knee wall outside that gave the back up generator a nice spot to live. The next two are in progress shot and then the after. 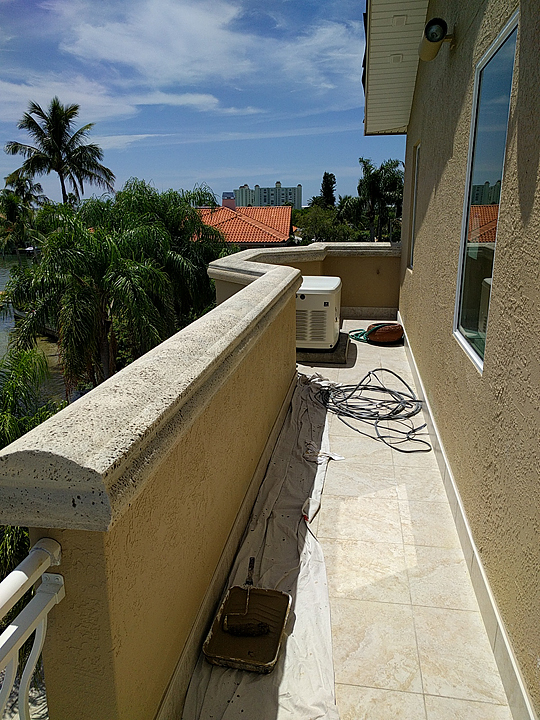 This work was done outside the master bedroom. 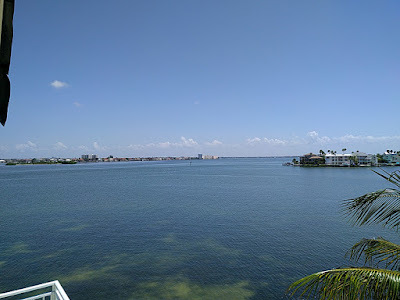 Here is the view. 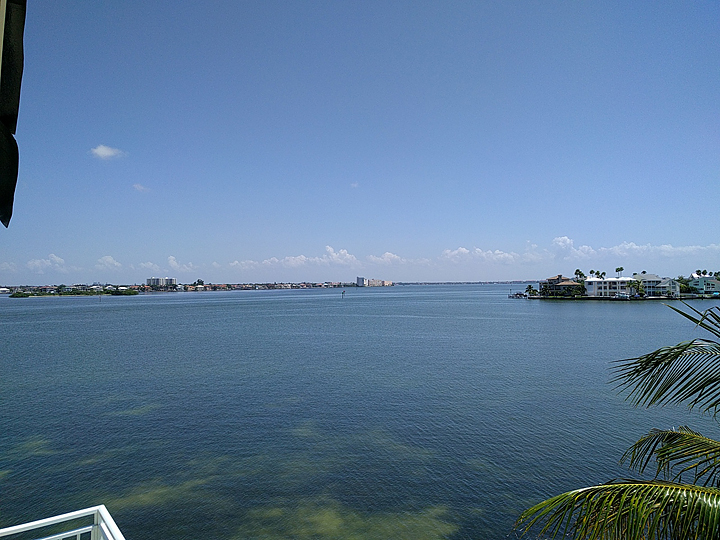 A nice view for sure.